Setting up a wireless phone system can be tricky. Especially when this is the first time you try to set up a phone system. So let’s check it out together and see if you have all you will need for a secure and robust WiFi phone system setup! Internet Connection and Adequate Bandwidth are obviously required to make and receive VoIP calls. You can contact your service provider to inquire how much bandwidth you would need to have a smooth conversation. Wireless Local Area Network (WLAN) is the next necessity to operate your WiFi phones wirelessly. You can use the same network that’s used for your computers and other wireless devices. Broadband Routers or Wireless Access Points (WAP) will also be needed to connect to a broadband modem and transmits signals to your WiFi phones. How many WAPs will be enough? It depends on the number of users, the range of the WAP and your network area size. A usual range is a maximum of 300 feet but walls and other factors could decrease that range. Check out some popular WAP options here. Quality of Service (QoS) prioritizes different types of traffic on your network. This will reduce common VoIP issues such as packet loss, latency, jitter, and echo and increase the voice quality. Therefore, having QoS capabilities is important when setting up your network. Wired Equivalent Privacy (WEP) Encryption – WEP provides the same level of security as that of a wired LAN. Change the Default SSID of the APs – Simply changing the default Service Set Identifier (SSID) set by the manufacturers to something unique or disabling the SSID broadcast out to the wireless devices will help reduce some malicious activities. MAC Address Filtering – Set up your MAC filter to give your network access only to the registered MAC addresses. In this way, you will be able to filter out most of the unwanted visitors. Now, there you have it! Don’t forget to review your system on a regular basis to reinforce and keep your system updated. 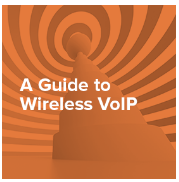 If you’d like to learn more about setting up a wireless phone system, download our Free Wireless VoIP Buyers Guide or raise your phone and call 1-800-398-8647 to consult with one of our VoIP experts today!